Drawing on the latest research -- the easiest method to lose weight, stop pain, and prevent disease. Vitamin D is a truly miraculous natural substance -- clinically proven to heal pain, prevent disease, and improve your mood. Vitamin D deficiency is linked to a wide variety of health problems. Increasing the amount of vitamin D in your body can help heal a remarkable number of diseases and ailments, including arthritis, high blood pressure, back and muscle pain, obesity, cancer, and diabetes. A dose of daily sunshine doesn't give you enough to get better. How can you increase your vitamin D levels safely and efficiently? Leading researcher and rheumatologist Dr. James Dowd shows you how to incorporate more vitamin D into your daily life. 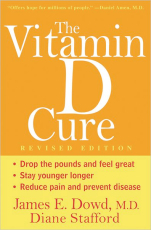 The Vitamin D Cure, Revised Edition offers a simple and practical five-step program that can prevent or alleviate many health troubles in just a few weeks. Incorporating the latest diet, supplement, and lifestyle advice and including all-new recipes and meal plans, Dr. Dowd's revolutionary program helps you harness the power of the sunshine vitamin to transform your life. Whether you struggle with arthritis or chronic pain from an old injury or simply want to lose weight and get back to your best self, The Vitamin D Cure, Revised Edition can be your key to a healthier, happier, more vibrant you.